If you want to see the beautiful autumn colors while you’re enjoying a wonderful vacation with the whole family in the Ozarks, look no farther than kayaking through the pristine lakes of Branson. The beautiful colors of autumn are everywhere, and you will enjoy them right next to the lake and the spectacular rolling hills around the Ozark mountains. The waters on the lake are quieter this time of year, which makes it great for kayaking and relaxation. If you’re looking for a fascinating outdoor fun experience through kayaking, check out White River Kayaking and float on Lake Taneycomo. White River Kayaking is one of the best outdoors in Branson where you can enjoy your vacation with their fun-filled kayaking adventures. Around the White River Kayaking area, you usually wait for the water levels to rise to start a decent float. Autumn season is a great time to take a fun kayaking adventure in Lake Taneycomo as you don’t have to paddle hard while cruising with the current. The current will really make your kayaking adventure a wonderful experience. When you get on the kayak for a great outdoor fun adventure on the lake, you’re sure to appreciate the spectacular colors of autumn. Floating on the clean and pristine waters of the lake is a great outdoor fun in Branson that many water enthusiasts in the Ozarks want to enjoy. Kayaking adventure on the lake is an awesome water fun activity to enjoy on the water, especially when you float down freely with the current that you don’t need to exert much effort on paddling every time. Kayaking is an exciting way to enjoy outdoor fun in Branson as you can have the opportunity to see beautiful colors of autumn along the lakeside while having an awesome water adventure. A beautiful downstream kayaking adventure on the lake can be enjoyed also on the 27-mile long flowing lake that starts at the base of Table Rock Dam and reaches farther to Bull Shoals Lake in Forsyth. While taking a downstream kayak adventure on the calm lake, you get to see many beautiful creatures such as blue herring, ducks, geese, deer, muskrat, squirrels, rainbow and brown trout, and even bald eagles can be seen as you go with the flow of the clean and clear waters of the lake. Lake Taneycomo in Branson is one of the best destinations for any water enthusiast who wants to try kayaking adventure. Its gentle flowing waters allow kayakers to relax and enjoy the adventure as the current takes care of the job. The smooth and calm waters of Table Rock Lake also allow kayakers to enjoy easy paddling, although without much current, they’ll find it easy to maintain the position while enjoying spectacular foliage around the lake. 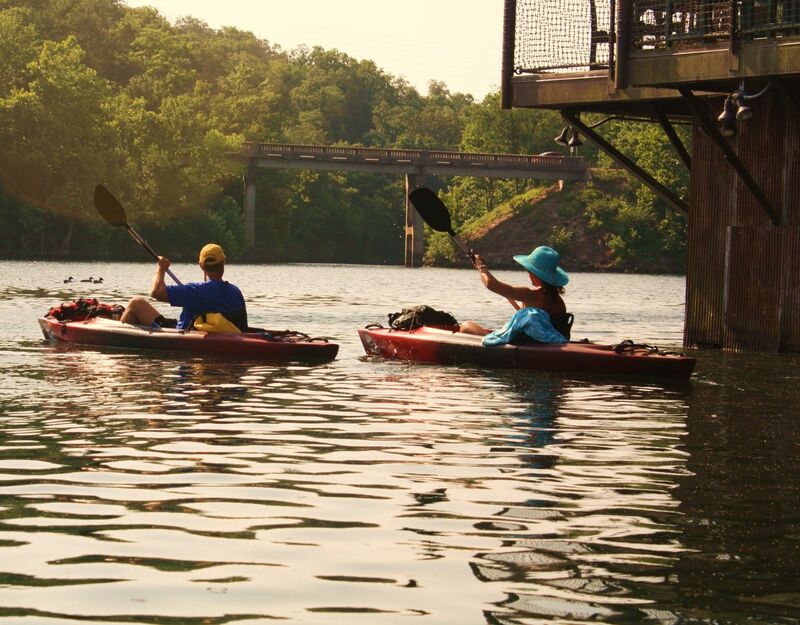 If you want to take a kayaking adventure on the lake, but you don’t own a kayak, you can avail kayak rentals at White River Kayaking, Downstream Adventure Tours, or Kayak Branson.